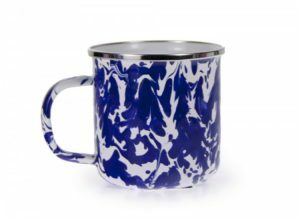 Our mugs come in enamelware, ceramic and stoneware. 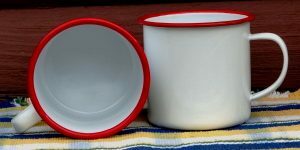 Enamelware mugs can be used for travel, outdoors and daily use. 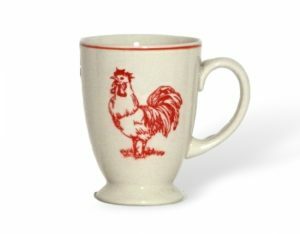 Crow Canyon Home jumbo mug will hold 24 oz of coffee to help you get a good start in the morning. 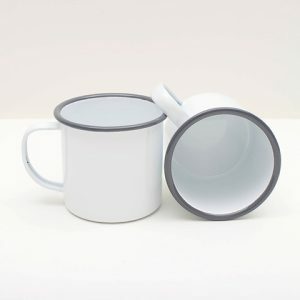 Enamelware late mug is a tumbler with a handle. 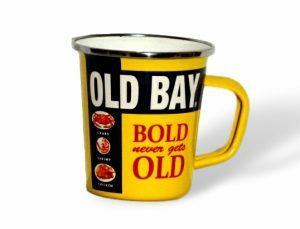 Use for hot or cold drinks. 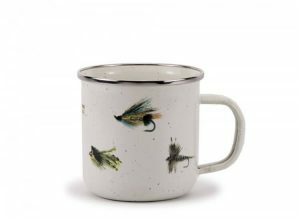 This enamelware mug has a fly fishing theme that is great for cabin decor or gift giving. 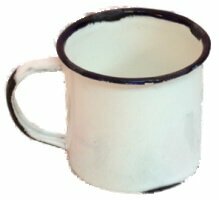 Vintage reproduction enamel mug with rustic finish. 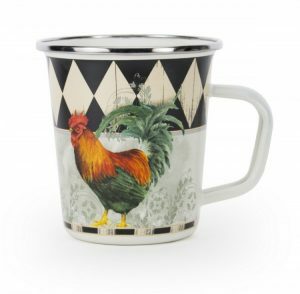 Enamelware latte mug in black and white with a colorful rooster that stands in the middle. 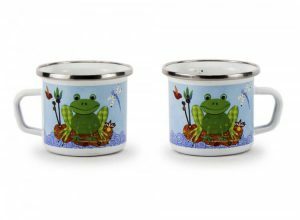 This child’s enamelware mug by Golden Rabbit has a green frog sitting on a red lily pad on a blue background. these products are durable and can be cut on, used in the oven, on the stove top, under the broiler and on the grill. The steel content makes them unsuitable for microwave use. 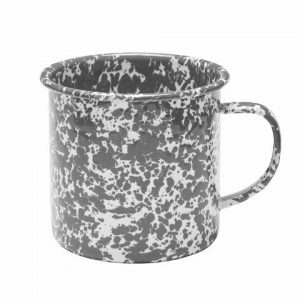 Enamelware mug covered distressed finish 22 oz. 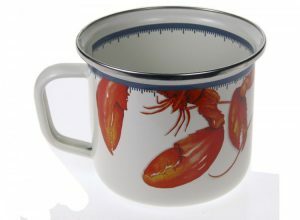 These distressed vintage style enamel mugs would look great on the vanity in your bathroom. You can reduce clutter without using ugly plastic containers for storing makeup and hair accessories. Stoneware covered tea mug with saucer and strainer. Reads, “You too are an EARLY bird”. 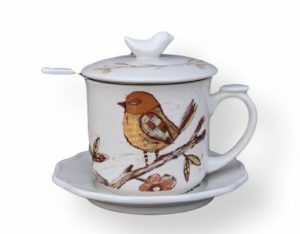 Stoneware covered tea mug with saucer and strainer. Holds 12 ounces. 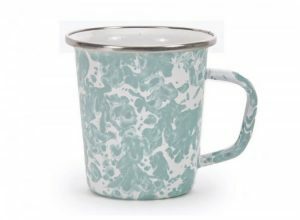 This enamel latte mug is also a tumbler with a handle. It has bold yellow, red and black colors. 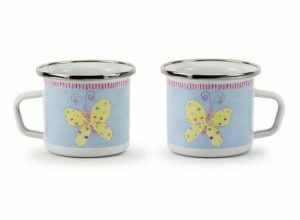 This enamelware child’s mug makes a great gift. 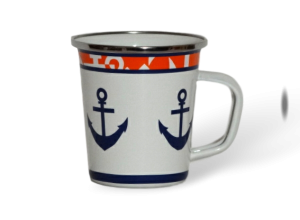 These mugs can also be used for small craft projects. 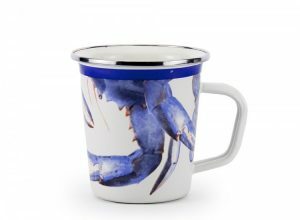 grande lobster enamel mug by Golden Rabbit. 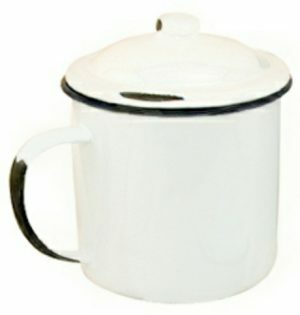 You will love storing your makeup, cotton balls or anything in this vintage style enamel covered mug. 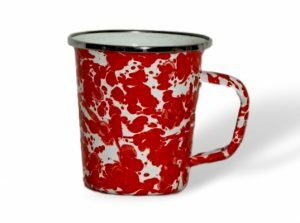 Jumbo marbled enamelware coffee mugs hold 24 ounces. By Crow Canyon Home. 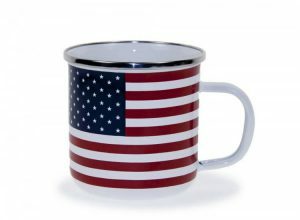 Red, white and blue enamelware 16 ounce latte mug by Golden Rabbit. 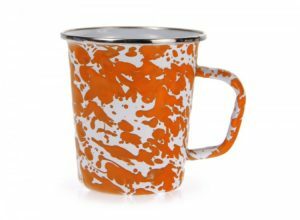 This enamelware latte mug is like a touch of sunshine because of the orange/white swirl coloring. It is just right for dining during hot summer days or anytime. 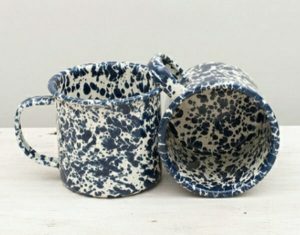 Use for hot or cold drinks. 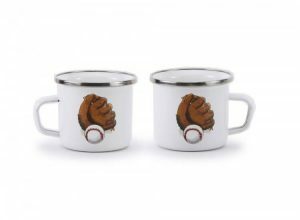 Child size enamelware baseball mug. 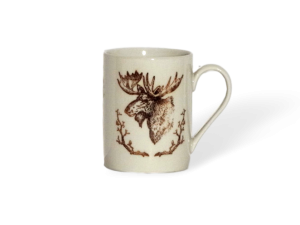 This mug has a moose design on the front and back. Great for your rustic decor. 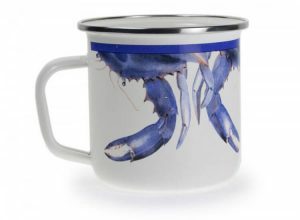 This blue crab enamelware mug goes with the blue crab dinner plate. Buy separately. 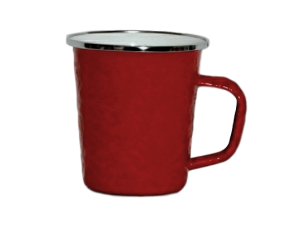 Latte enamel mug red swirl with stainless steel rim that protects from chipping. Color red swirl.